CyberpowerPC Inc. www.Cyberpowerpc.com, a global leader in custom gaming machines, today announced new desktop gaming systems based on 3rd Generation Intel Core i7-3770K (3.50 GHz), Core i5-3570K (3.40 GHz) and other 3000 Series Ivy Bridge processors. 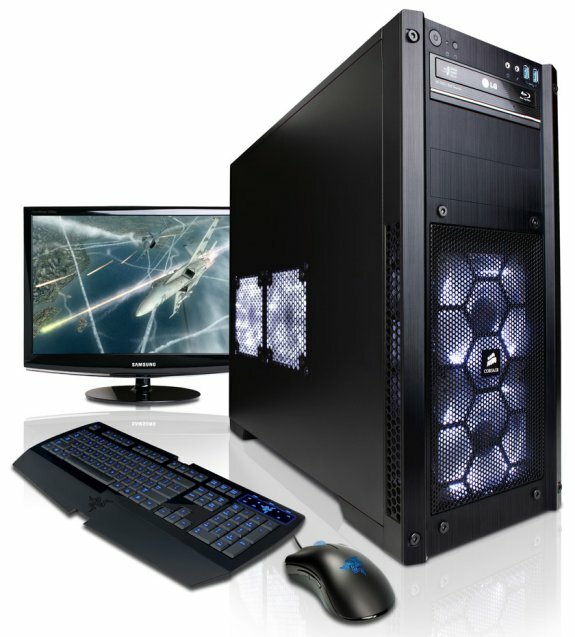 CyberpowerPC customers can configure the ultimate gaming platform based on the new Ivy Bridge CPUs paired with recently released Intel Z77 chipset motherboards. The combination provides a 10-15% performance boost over Sandy Bridge 2000 series CPUs and offers advanced overclocking; native USB 3.0 and PCI-Express Gen 3.0 support; Intel Turbo Boost Technology 2.0; and next gen DirectX 11 ready Intel HD 4000 graphics along with quick sync technology. Ivy Bridge i7-3770K and i5-3570K processors will be available in CyberpowerPC's top-of-the-line Fang III Viper and Cobra models as well as the newly launched and award winning Zeus Thunder and Gamer Xtreme series of custom gaming PCs. Ivy Bridge systems start at under $800. CyberpowerPC’s new Ivy Bridge gaming PCs are targeted for gamers and multimedia enthusiasts looking for Intel's latest and fastest platform with next gen compatibility and support. Users familiar with some of the features on Sandy Bridge-based systems will find themselves at home with continued and refined SSD caching support via Intel's Smart Response Technology, which dramatically increases system responsiveness. Performance users will love the new Lucid Virtu MVP technology which enhances performance by combining Intel's next gen onboard graphics alongside powerful discrete GPUs from NVIDIA and AMD that can provide up to three times the graphics performance. CyberpowerPC gaming systems based on 3rd Generation Intel Ivy Bridge CPUs and Intel Z77 chipsets will be made available at the company's website as well as online retailers: Newegg, Amazon, Tigerdirect, and Buy.com in additional to retail outlet Fry's Electronics. In Canada, Future Shop and Best Buy Canada will have Ivy Bridge packed systems ready to ship. All CyberpowerPC gaming systems can be customized with a number of performance enhancing hardware and component option such as the Advanced Hydro Liquid Cooling kit, super fast solid state drives, Blu-ray drives, performance gaming memory, gaming peripherals, business and productivity software, and more. All systems are housed in feature-rich chassis from top tier manufacturers that offer unique styling, silent performance and extreme airflow. CyberpowerPC gaming PCs are preloaded with Microsoft Windows 7 Home Premium with SP1 for an enhanced gaming and multimedia experience right out of the box.